This tiny puddle yesterday was a much welcomed sight! We are in an extreme drought and trust me everyone is happy when it rains now! We are behind something like 20 inches and the driest in more than 60 years. I have to say it has not rained here for quite sometime –weeks actually. We have not had to mow our yard since, um.. well, since the third week of May. Sure people are mowing their grass & weeds but it is like a giant dust storm as they make their passes over the yard. Not worth it in my opinion. Every little bit sure helps out. 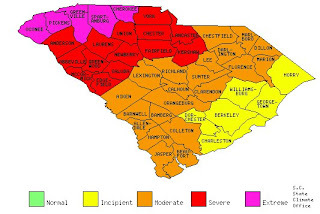 Check out SC DNR for more information about the drought.